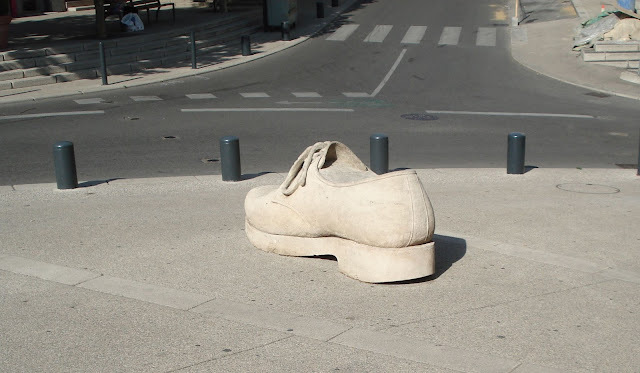 Shoe sculpture in Roman-sur-Isere, France, September, 2011. When I walked into a shoe store in Romans-sur-Isere and asked for "brogues" for women, the sales associate had no idea what I was talking about. I then tried the word, "oxford"; that did not work either. 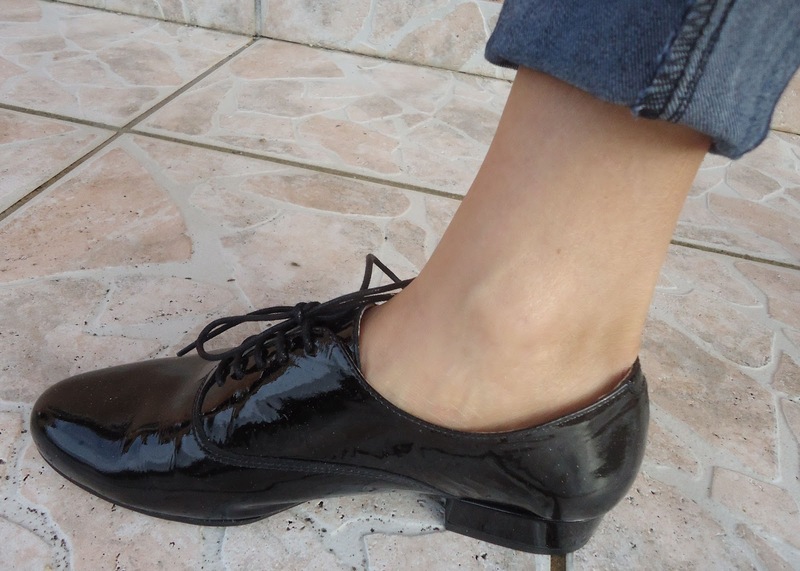 Finally after showing her a pair of men's shoes, she said, "Ah oui, vous voulez Derby!". D'accord! Call it what you want, the Brogue/Oxford/Derby appears to be the flat for the Fall of 2012. (Even though this may be the "tendance" - the "trend"; ballerina flats are also everywhere, and so I believe, like loafers, all these flats will always be there from which to choose.) However, as "tendance" goes -what is popular for the moment - it seems that brogues outweigh ballet flats this fall. But it isn't just "brogues" that are popular but rather any "man-style" tie-up or buckled shoe. The French Elle, September 2012, identified "derbys" as the flat for the season. A brogue can be an oxford but an oxford is not necessarily a brogue. What's the difference? And what is a "derby" anyway? Brogues get their name from "broguing" or perforations along the seams of the multiple pieces used to construct this flat shoe. There are also a variety of toe cap references, primarily wing-tip, so named because of the W shaped toe cap, a design resembling a bird's wingspread. An Oxford can be a Brogue, but isn't always - remember it's the perforations that make a brogue a brogue. The shoelace eyelet tabs are hidden under the vamp whereas in the Derby, you see the tab on top of the vamp. Yet the "Derby" by Danish-based Emma Go listed at 160 Euros on page 104 of the French Elle September 2012 issue has no tabs, no broguing and could be called an Oxford, although it looks to me like a flat men's inspired look with buckles, no shoelaces. Traditionally, it is the shoelace eyelet tabs, sewn on top of a single piece vamp, that differentiates the Derby from the Oxford. NEW: I have always preferred delicate shoes so when I found a pair of patent leather tie-ups without a heavy looking sole, nor with the broguing or perforations, I immediately felt that they were perfect to get me through this year's fall "tendance". By definition, I suppose they would best be called an "oxford". I bought them in Romans-sur-Isere. I can't remember the shop's name, although it doesn't really matter, because the sales associate from the store I entered went to another location in the shoe mall to help me find what I wanted. It seemed as if the sales associates were all friends and helped each other out or that all the stores were owned by the same company so it didn't matter - a sale was a sale. NOTE-WORTHY: What to wear with a brogue/oxford/derby? The "tendance" is to roll up your skinny jeans or have your jeans come to that point well below the calf muscle with a "fashionable" width between ankle and calf. This is perhaps not the most flattering look for shorter women and the look with flats is difficult to wear. As always, I think heels look better and although the magazines are showing this pant length with heels, the weekend casual look for fall 2012 in Paris happens to be brogues/oxfords/derbys, at least for the moment.